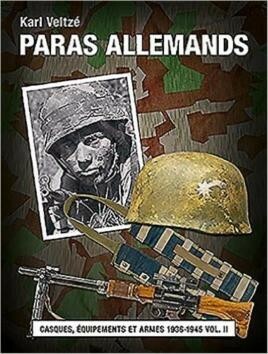 Unfortunately, due to sales rights restrictions, we cannot offer Les paras allemands volume 1 for sale in your country. The first of three volumes, this book is part of a series considered the most complete and detailed study on the uniforms and the equipment used by Second World War German paratroopers (Fallschirmjäger). Virtually every element of the uniforms is presented in detail, including different models of parachutes (Knochensack) and all the equipment used by the Luftwaffe from the mid-30s until the capitulation of the Reich, as well as the typical badges of the Fallschirmjäger and many untold stories. In short, this book accompanies the reader through a visual but detailed reconstruction of the operation of "Green Devils" and the attack Norway carried out during the last days of the Third Reich against the Belgian fortress of Eben Emael, but also through the campaigns in Holland, Crete, North Africa, Russia, Italy, Normandy and the Ardennes. With the help of collectors and museums from all around the world, the author and his German publisher started an unprecedented and prolific collaboration. The three volumes contain thousands of unpublished photos of objects belonging to the Fallschirmjäger, including coins that have never been seen or studied before.